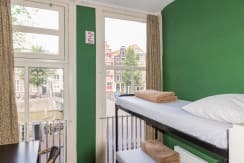 Hostel the Globe Centre is located near the famous Red Light District and enjoys views of two major canals. 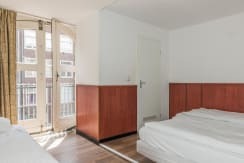 Central Station is just three minutes' walking distance from the hostel and less than a ten-minute walk from major attractions including Dam Square, Flower Market, shopping, the lively Rembrandt Square, many coffee-shops and much more in between. 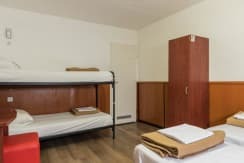 The hostel location is great to have some peace and quiet away from the centre which is close by and easily accessible. 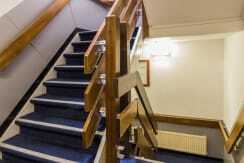 The hotel has 20 clean and pleasant private rooms, each with its own ensuite bathroom and shower room. 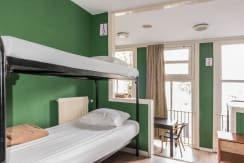 It has triple, quadruple, and up to 10-bed family ensuites available. 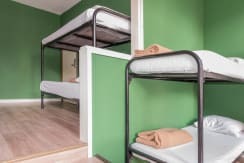 Besides this, we have the largest collection of shared dorms here in Amsterdam. 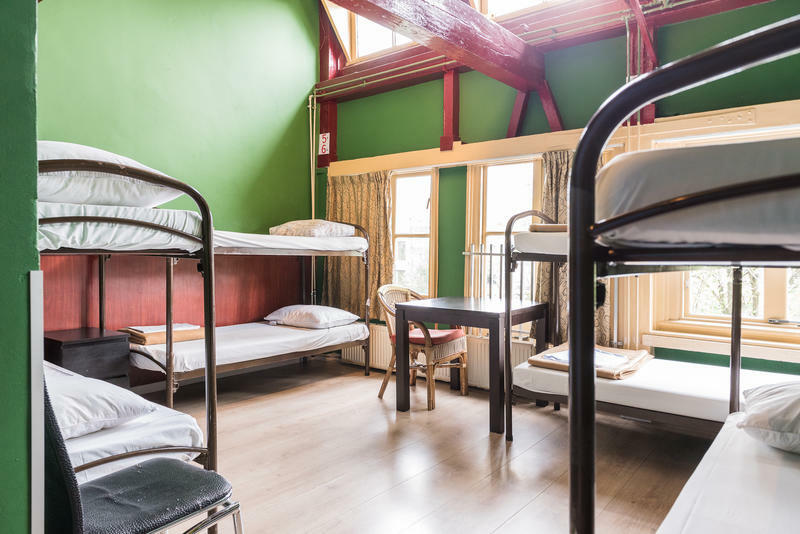 We have shared dorms accommodating from four persons up to 20 persons! We also have a free wireless connection available in the lobby area. 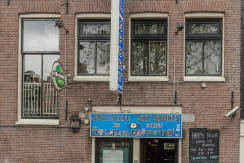 One of the Red Light Districts' larger bars is situated here and is open until 3am on weekdays and 5am on weekends. You'll also find a restaurant here serving English and American breakfast, lunch and dinner. 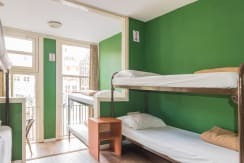 The hostel also has a sports café which shows all major sport events on two big screens and nine TVs, such as the Super Bowl, Premier League and many other events. A pool table and darts board is available for those competitive guests. Payment is on arrival in Cash or by Credit Card/ Debit card! We only accept Visa/MasterCard! The service charge is 5% for the Credit card/Debit card. By law, smoking is not allowed in the hotel rooms! 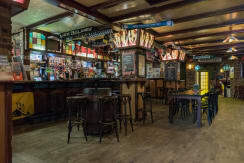 There is, however, a large smoking section in the bar. We have a 48hr cancellation policy (AMS time). Late cancellations and no-shows shall be charged the equivalent of the first night's accommodation. 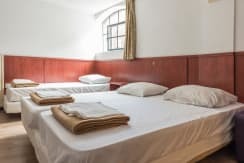 Your room will be held for two hours (AMS time) after your given arrival time; after this time we have the right to charge your first night's stay. Please note that there's no elevator in the hotel! Only traditional steep Dutch stairs are available! A deposit is required for room keys and all kinds of borrowable items. The deposit will return to you once you return them back us. Earliest check-in is 1pm and latest check-out is 10am. the kitchen belongs to the bar on the ground floor, thus it is not open for public usage. Any sorts of noisy activities are strictly forbidden in the hotel rooms. Please bring your party downstairs to the bar. Safety is our primary concern, so please expect tight security control at the hotel entrance. We apologise for any inconvenience in advance. You can take the train to Central Station Amsterdam which won't take you longer than 20 to 22 minutes. Walk out the front entrance and head in the direction of 10 O' clock, towards the church tower and flags 150m away. To the right of the NH Hotel Barbizon, walk down Nieuwe Brugsteeg and take the second right down Sint Olofsteeg. You'll come out onto a canal (Oudezijds Voorburgwal) where you can see Hostel The Globe situated directly on the left side across the first bridge. You'll see a big sign saying HotelThe Globe.